Space is at a real premium in England and building new houses just hasn’t happened enough in recent years. Our normal houses have never been big in comparison to our European friends but our desires for large and more stylish homes is thankfully increasing. This leaves us with a problem though in that we have a small house and want to upscale but moving to a bigger house is unaffordable because demand outstrips supply and space is at a premium in the areas we want to live. 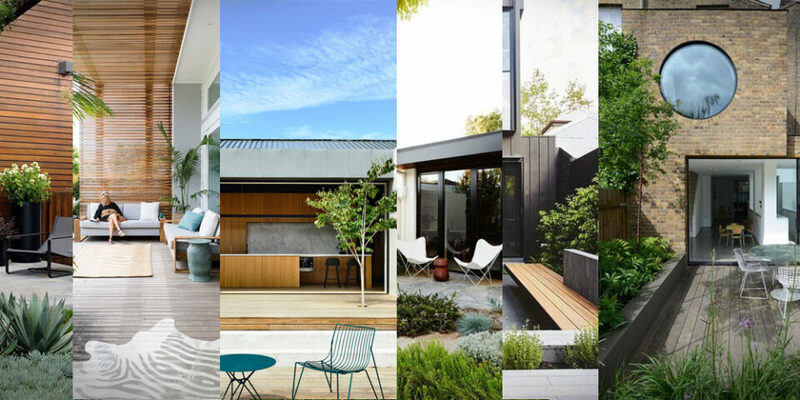 The answer is some very creative and interesting architectural solutions, some of which I have sourced some pictures of to give you some ideas for your own place. Not an uncommon English town house, this super extended terrace makes the absolute most of the space it has. The extension goes some way into the garden but the fact that the owners have opted for an Astroturf lawn suggests that they perhaps have little time for maintaining it so a smaller garden is no hardship. The extension boasts lots of roof lights in an attempt to not make the long narrow building too dark and the effect works well. In contrast to the previous houses design, this building makes no attempt to blend into its original surroundings. The strong black facades are very Scandinavian and striking with the design playing on the available contrast in the light brick buildings and the light floor. Similar to the first house but this time an all round bigger starting point. 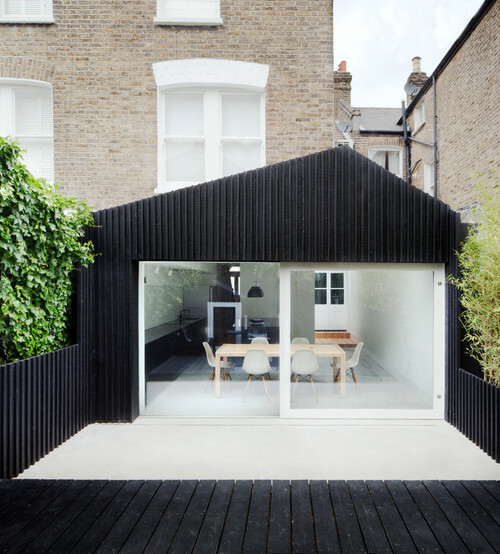 The building has been incorporated more into the garden and the 2 sided glass wall enables the kitchen diner to be opened right up and bring the outside inside. 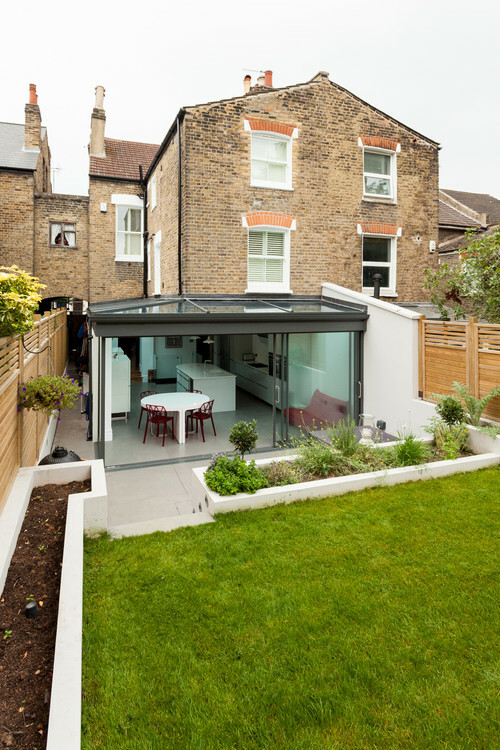 The roof lights also lighten this space and the patio just next to it helps to blur the line between internal and external space. This design really struck me as radical! The basement installation is not unusual now in London but the removal of the entire rear wall most certainly is. The effect though is a period house that is far lighter than one could ever expect and the 2 storey doors really bring you outside when sitting in. 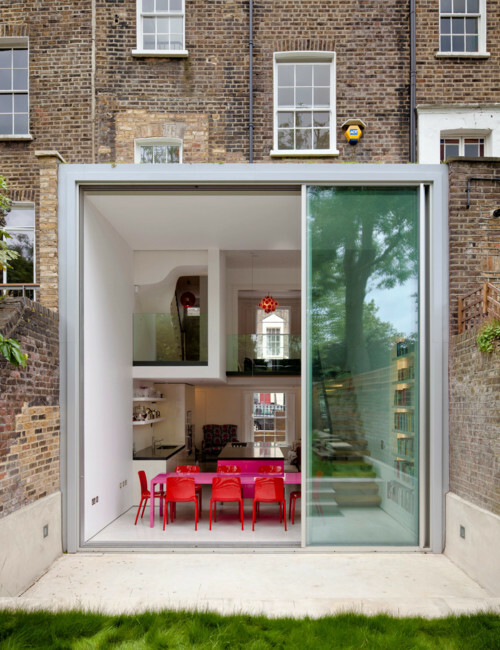 A very interesting and no doubt very expensive way to open up a house. This is essentially and conservatory but more closely integrated into the building. The corner of the house has been removed and in it’s place is air. 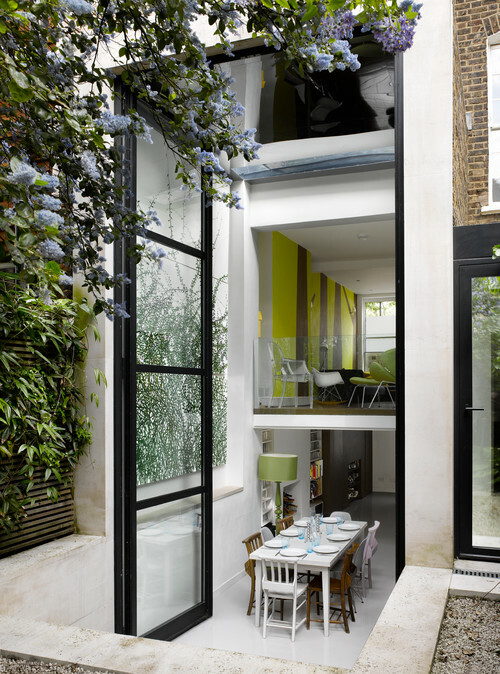 The large sliding doors that run the expanse of the room open up the dining space so that the patio is more accessible but the garden is still made to feel like a separate space by layering the different areas. Wow! Space was not at a premium here and neither was money. 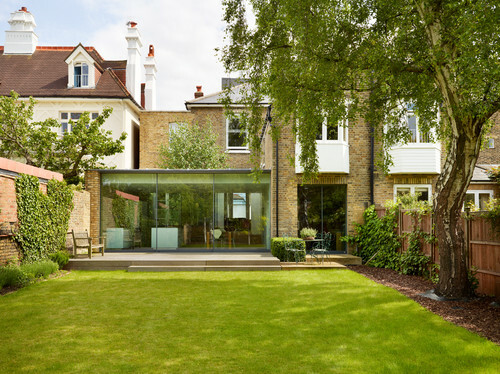 The already large house has been boosted by this stunning glass all round room and garden design. 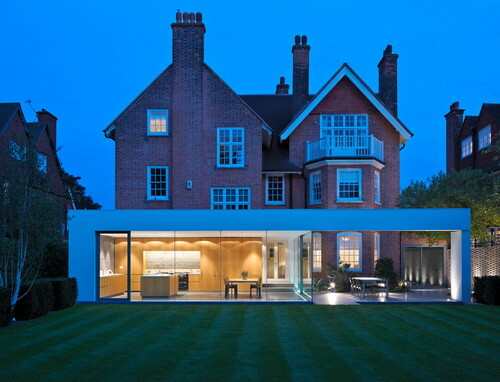 Again money and space not a premium here and the contrast of old house and modern extension works really well. 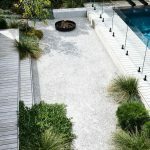 The perfectly manicured lawn suits both new and old sections and walking through the house must be a real contrast of expectations. 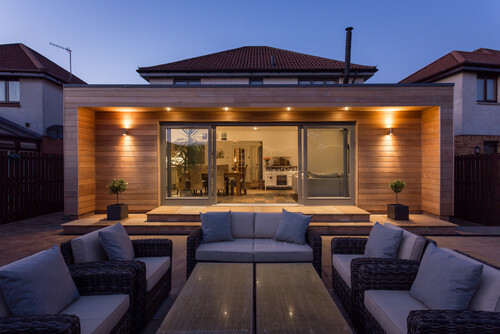 The use of lighting adds a really nice feel to many garden design’s and modern extensions and can highlight certain key areas of design or just enable viewers to see the work from a different perspective. This is probably the most ordinary of all the houses and could well be just an English council house but it goes to show that you can work with anything. 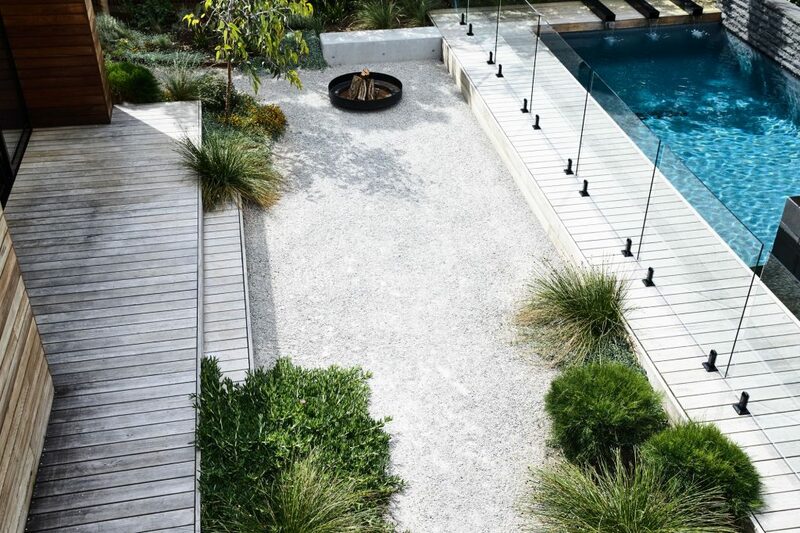 The geometric design complements the house well and provides a large amount of extra space and style. One final example of an nice extended English semi with a large glass expanse that lets plenty of light in and opens a space up. 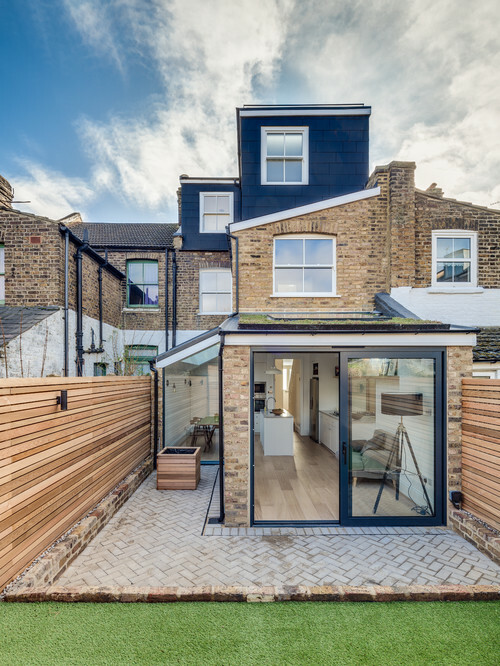 Over all what we can see from all the extensions is that instead of just being an extra block of space they are creating more open plan living and trying to lighten up some quite dark homes. 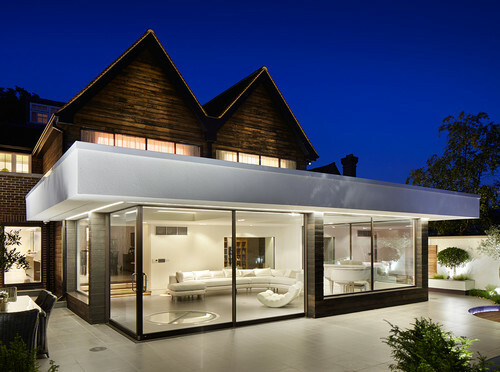 The use of glass and large sliding doors is very prevalent. 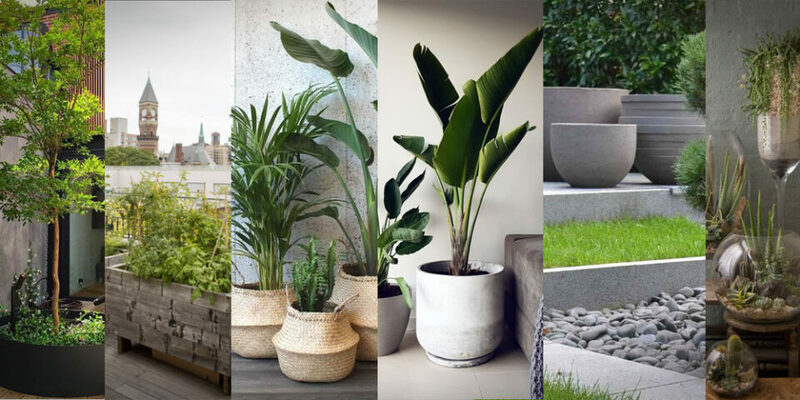 This is an increasing trend that we see where people are wanting to bring the outside in and work with whatever house they have. 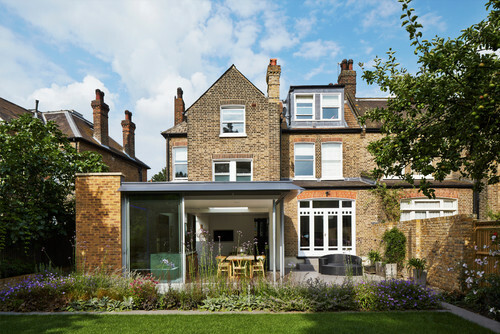 In England that often means styling an older house with a striking new contemporary extension.